2P START! Live! Season 3 Begins! | 2P START! 2P START! Live! Season 3 Begins! 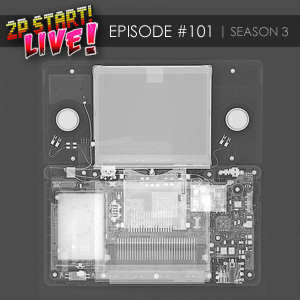 Tim and Ray get back into the groove of weekly podcasting with new chapter art, discussing their thoughts on the new Nintendo DSi XL, disagreeing over the wait for the new Zelda Wii title, and Ray lays into Nintendo for saying they’re not in competition with Apple. Oh, and how many curse words were in ‘Paranormal Activity’? Gonna start watching in a sec. Really like the new art work. 1. 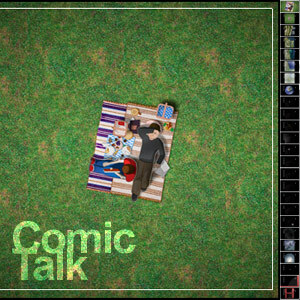 Startdust Road music was a good pick for Comic Talk. 2.I really think it’s weird how quickly this new DSi was announced. They just released the DSi, do we really need another? 3. I agree about Phantom Hourglass’ graphics. Link’s face bothered me immensely. It looked like he ran into a wall. 4. During Tim’s “How dare they!”, it sounded like he was speaking that snake language from Harry Potter (I’ve currently forgotten the name). 5. I really like how you’re using Metroid music with the BDAs now. 6. 2010 seems like it’ll be a much better year for the Wii, because this year was pretty bad IMO. I look forward to Trauma Team, Endless Ocean, and Metroid. But Nintendo does need to step it up a bit. Wow, downloading it right now. Also, I was curious, are you going to make new title themes for the various segments of the show? I think a refresh would be a nice change of pace. WE SHOULD DO A CONTEST ON THE FORUM! That would be awesome, I would love to participate. Cool new slides, Ray. Too bad I can’t actually see them in the player anymore. Are you seriously complaining about Zelda coming out late, Tim?! Did you forget Miyamoto’s words? And I agree with Ray’s response as well. But what if a bad game is delayed? Earthworm Jim 3d was delayed for a long time and it was bad. Earthworm Jim 3D wasn’t delayed so much as constantly overhauled. In the end, the product was still rushed. Also, thanks to wonderful Wikipedia, the scene in Paranormal Activity with the girl and the, er, missing arm was removed from theater releases. No, I haven’t seen the movie and I was told seeing it was a sheer waste of money. One last thing, I stumbled upon The Webcomic List, who is currently having a Comic Awards. Anyone who works on a webcomic, reviews webcomics, is actively participating in a webcomic, or can explain why their vote counts can nominate a webcomic. So if there’s enough interest, maybe 2P START! could win an award? before i tried to play the podcast i saw the silver surfer pic as the musical misfit and i was like ohhhh i better get credit for that! then i heard “im going to start off season 3 with a pick of my own…” NOOOOO (shakes fists) “…but i would like to thank vincent elia” YESSSSSS (dances happily). that was quite a sudden shift for me from sad to happy. I have to agree with Ray on the Zelda argument (despite the 1/3 of a Comment of the Week from Tim). We already have several new awesome games coming out, so they’ll keep me entertained while awaiting the new Zelda game. Besides, any more epic games within one year and I probably couldn’t afford all of them at once anyhow (in money and/or time) — which on a side note also takes away the fun of picking up a game on launch day. I guess I just classify Zelda differently than other ‘distractions’ that Nintendo releases. There will always be plenty of fun games to play by Nintendo or other companies. I’m just not okay with a new Zelda title every 5 years! To put that in perspective, at this pace, Lily will graduate high school only 4 Zelda console games from now. That’s just wrong to me! There was an 8 year gap between Metroid II and Super Metroid, so I think 5 years isn’t too horrible. I mean and we have Spirit Tracks coming out so I’m not quite sure I understand the complaints. A Zelda game is a Zelda game, does it really matter if it’s on a handheld or not? Hm, yeah, I can see where you’re coming from, Tim. As a Metroid freak, if Other M was pushed back another two years (to match the five-year lapse of Zelda), I’d probably be a bit upset. At the same time though, the other games would at least help the wait, and the quote Kvb mentioned (which was pretty much all that got me through the painful Brawl delays) still holds true — I’d rather wait an extra two years for a “complete” game than have a game now that could’ve been better (though the question is if they’re actually using the “delay time” effectively). So if Metroid started only* releasing games around every five years, I’d be fine with that, as long as the overall quality of each game is better than it otherwise would’ve been. But Tim, here’s the other dilemma: If Nintendo releases all 3 games next year, then come 2011, everybody whines that Nintendo isn’t releasing any games in their core franchises and start making “dust off my Wii” jokes again. Of course, if Zelda Wii does come out in 2011, people will complain that they only released Zelda that year, because people love to hate on Nintendo no matter what they do. Something to keep in mind, though, is that they haven’t said it’s not coming in 2010 yet either. Think about it: If they said 2010 and had to delay it, A. people would complain, and B. we would have TP all over again with people expecting the second coming of OoT. If they don’t say anything and release it in 2011, people will complain about the wait, but not as bad as if it was given a date in the first place. If they don’t say anything, but it ends up being ready by 2010 anyway, everybody is happy. So not announcing a date is the best thing for them to do as far as the end result is concerned. Used to be, yes. Generally, if it came out on the Game Boy, it was simply a side-game to whatever franchise it was; likely something I wouldn’t bother playing anyway. Now, with the DS, I still see it somewhat the same way, but Nintendo doesn’t seem to see any difference. And I suppose, given the lessening disparities between console and handheld tech these days, their approach makes sense. But still, for me, there hasn’t been a new Zelda since Twilight Princess (which is just as well for me as I still haven’t finished it). I guess I’m the only one to agree with Tim. I really think that 1 game per console isn’t acceptable anymore. Especially with the Wii, because only those games are great most of the time. That’s why I didn’t buy a Wii, (ignoring the fact I play Zelda on the one my dad bought). Righto Tim, IMPATIENT PEOPLE… UNITE! @gewurtz: I wouldn’t say that applies as much to Zelda, though, at least it didn’t used to. LA and the Oracles are among my favorite Zelda games, and I think they hold up to the quality of the rest of the series. Oh and to clarify, I’m an idiot. It was an 8 year gap between Super Metroid and Metroid Prime/Fusion. Reggie said there will be no HD Wii, and Iwata (I believe) said something about looking into HD, but didn’t say it would be for the Wii. Basically, the next console will likely be HD, but releasing an HD Wii wouldn’t make sense because so many people already have a standard Wii. Yo guys. I know I dont comment alot, and I regret it. Ihave school work, and alot I have friends over, so not alot of time to log on. Anyways, great podcast, loved the comic also. Also, back in podcast 100, I wasnt mentioned in the “Rise from your grave” segment. And if your wondering about what happened to mmy little avatar up there(If you even know who I am yet.) , I wasnt logged in and was just too lazy to log in. Im like that. Well, see ya later guys! Heh. So much for my prediction about DSi XL Black Doom. Although, I’ll venture a guess for next week’s BDA. Predicting that one of next week’s BDAs will go to a specific developer under Activision (yeah, I’m keeping it ambiguous this time). Well, time for a Musical Misfit suggestion… since I have nothing better to do during my lunch break at work. I’m going with Bomberman Generation: “Dodge Battle!” To this day I find it a shame that it’s tucked away in only the dodge battle multiplayer mode, a mode which I find it hard to get people to play. The music is also eons better than the normal multiplayer mode music. Hey guys, great podcast to start off season 3! I really like the new pictures that you guys are using for the segments. I agree with you guys with the new DSi model that is coming out. I really wasn’t for the DSi when it first came out, but now it seems like they’re just whipping out new types of DS to make more money XD. I really liked Ray’s Black Doom Award for this week; I think that Nintendo does need to admit that they are lagging behind with the handheld market (Pretty much the only thing they have going is the first party games now since the novelty of the touch screen has worn off) and I believe that they should either catch up with their competition or choose a different route. They’re lagging behind in the handheld market? Really?! The friggin’ WII is lagging behind the DS in sales, how is the DS lagging to anything? I think they’re lagging behind because I don’t think Nintendo is paying enough attention to the handheld gamers. Like sure we have the first party games here and there from time to time, but there really hasn’t been that handheld gamers have been anticipating. You’re really going to judge The Taking of Pelham 123 just on that one scene and the curse words? I mean, to be honest… it’s John Travolta, he swears and when I go into a movie I’m pretty much expecting it. (In other characters though, I find it more believable). In any case, that whole arc is terrible, with the webcam and the girlfriend. I actually wanted to see him dump her, after she’s like OMG, you are a hostage on a train and you might die if you talk to me but you won’t say you love me? Seriously, dump her. The movie was horrible for a lot of reasons, you’re just hearing a couple examples. But yes, when she asks him to say i love you back and he could easily get killed for talking, i was hoping something horrible would happen to her! SNESpg, is that Ray’s hand in the suggestion box image? Anyway, the new art is defiantly worth the wait. Hope you get an equally good comic on Wednesday. He didn’t exactly say he wasn’t competing with Apple, DID HE? Anyway we need more maths, WOO! Not sure that’s a fair comparison as it stands. For one thing, most of the games you listed in the GC list are “shell” games, featuring gameplay that is vastly different from what the franchise was known for in the past (for example, Star Fox: Adventures is a platformer that was originally going to be something else, most of the Donkey Kong games were rhythm games, and Kirby’s Air Ride was an absolutely pathetic racing game!). Plus, it seems only fair to include the Wii Sports games if we’re doing a first-party comparison (it does count as a new franchise now). Though you have a point in one regard. There do seem to be more overall GC “first-party” games for Gamecube’s 5-year lifespan, but there’s a reason I put that in quotes. A fair amount of the GC’s line-up was farmed out to third-party developers, whereas I can only discern three such titles in the Wii’s line up (Metroid: Other M, Mario Party 8, and Battalion Wars 2). Star Fox: Assault and the Donkey Konga games were done by Namco, Zelda: Four Swords Adventure by Flagship (Capcom), the entire Mario Party series was handled by Hudson, F-Zero GX by Amusement Vision (Sega), and Battalion Wars by Kuju Entertainment (a studio with heavy ties to Microsoft). Also, it’s worth noting that Star Fox: Adventures was handled by no-longer-Nintendo-owned Rare Ltd. So as far as raw count goes, we’re seeing a bit fewer games for the Wii because some of the third-party companies Nintendo had contracted during the GC lifespan have not returned to develop for the Wii. As for why, it’s all seems to be theoretical at this point. Either those third-party developers were pulled back to their own publishers to work on internal projects in light of the Wii’s sudden popularity, or Nintendo didn’t bother contracting those companies again due to the system’s popularity. You’ll note that two of the three third-party developers that worked on Nintendo-established franchises for the Wii had their games released during the first year of the Wii’s lifespan, and that the recent contracted third-party developer (Ninja Studio for Metroid: Other M) seems to be working on a game aimed at an older demographic. So (leaving out LCT), you’re up to 23, giving the GC a 5-game advantage, with 3 of those being Mario Party. After some thought, I have to disagree with Ray. I still don’t think the iPhone/Pod are directly competing with the DS. For them to compete, not only does somebody have to buy a different product, but they would have needed a reason to consider the other product in the first place. Just because they have similar features doesn’t mean they have the same targets. Somebody who wants a gaming handheld probably isn’t going to bother considering an iPod, while somebody that wants an mp3 player isn’t going to choose the DSi. Yes, the DSi can play music, but it’s not in the mp3 player market. It’s just a gaming platform that has an extra feature. yet I think you would be hard pressed to consider that a competitor to the iPhone or DS. If somebody was looking for a netbook, you wouldn’t say “How about an iPod instead?” Similar features do not make a similar market, and unless the iPod makes some significant changes, it’s not going to be considered a legitimate gaming platform. Have to disagree with you. The iPod Touch/iPhone is absolutely a legitimate gaming platform. There are many thousands of games available on it, it has support from many major 3rd party game developers (like EA, Square Enix, Namco, etc. ), and sales are just BOOMING! I personally use the iPod Touch almost exclusively for games (with a little email and web browsing), and not at all for music. My DS gets used about 1 minute for every 99 minutes on my iPod Touch. I know I’m not alone! And your point about similar features is a little weak. Certainly a desktop has SOME features in common with a netbook or iPod, but when you look at ALL of the features, and see that they line up almost perfectly with another product, you have to consider it a competitive device. Sure, it may beat the DS in game count, but a large percentage of the iPod games are crap. You certainly can’t complain about the price, but you get what you pay for with a lot of them. Correct me if I’m wrong, but most of the good iPod games are either puzzle games or very simplistic. I love puzzle games, don’t get me wrong, but as far as something to rival the amount of time you could sink into an RPG like Pokemon or Chrono Trigger, or beat the platforming of New Super Mario Bros., or take on the adventuring of Zelda, I haven’t heard of anything that comes close. Maybe I’m just a sucker for first-party Nintendo series, but I just don’t see anything that can match the quality of the DS. The other main issue I see with the iPod as far as gaming is concerned is controls. Certain games aren’t possible (or just stink) without buttons. You yourself have complained about games like the Mega Man port that simply doesn’t work without actual buttons. Sure, puzzle games and such work fine with simple, but there are large genres (like platformers) that simply won’t work as well as with physical buttons. You do have the tilt sensor, which can help for things like racing games, but as the Wii has demonstrated, tilting isn’t good for everything. Even if you look at something like Scribblenauts, which had people clamoring for an iPod version before release. After it released, the main complaint was that it used the touch screen too much instead of the buttons. How much worse, then, would it have been on the iPod, which doesn’t even have the OPTION of using buttons instead? Yes, but I still don’t think those features are handled in the same way. The iPod can play games, yes, but in my opinion they are mostly 5-minute games to play while waiting for something else. With the DSi, playing music certainly isn’t its main focus. I may be mistaken, but can’t that only be done through an SD card (as in the music can’t be stored on the DSi itself)? That’s certainly not the most convenient. While they do have features overlap, they each treat a different feature as the priority, and the other features as secondary. They are getting a lot closer now than they were before, but I just don’t think the iPod as it stands now would be able to make a severe impact on Nintendo. If and when Nintendo releases a (completely) new handheld, I would be willing to bet that the sales would track very similarly to the DS’ sales, because most people who want a gaming platform would rather spend hours jumping on Goombas and killing Moblins than throwing paper into a trash can and shaking babies. A. Look for a review soon for an iPhone platformer that knocked my socks off. B. This should put an end to the discussion as it contradicts what Nintendo said more recently. C. “but I just don’t think the iPod as it stands now would be able to make a severe impact on Nintendo.” Too late. 2. Funny that the PSP wasn’t mentioned. And although this is the same place he says they aren’t competing with Apple, here Iwata says “On the other hand, the data also showed that Nintendo DS has not lost its footing at all. Actually, it has been even increasing its footing all around the world.” So that’s apparently another contradiction, because he claims that DS sales are still growing, which, obviously, would mean that the iPod wasn’t effecting them enough to cut sales. 3. 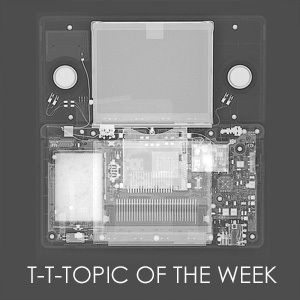 Well, I don’t know if you would agree on this, but I would think the iPod would especially not have an impact on the Wii, making that part irrelevant. In fact, I believe Iwata has admitted recently that they’ve messed up with the Wii this year, which lead to its drop in sales, and eventually the price drop. So as far as that link goes, it doesn’t help answer if the DS has anything to do with the profit forecast being lowered, let alone if the iPod had anything to do with that. As far as other links goes, here says that 20 million iPod Touches have been sold (as of Sept.), where this talks about Nintendo shipping its 100 millionth DS back in March. Obviously that doesn’t include iPhone sales, but that gets into more issues, since a lot of people buy iPhones as a phone. Wikipedia says 33.75 million sales of that, but the source didn’t give that number explicitly so I don’t know about it. Then you get into the issue of how long each was released, blah blah blah, so don’t take those links as “these are proof” but more as something to look at. Note: the preview doesn’t seem to like the three links (everything between the “here” links is just not there), so I may repost this if it doesn’t work, in which case just delete this post. OK, so looks like it was just an issue with the preview. Weird. FYI, it was pretty much just like I said, with my post just like it is up there, except once it got to the first linked “here”, it skipped to everything after the second linked “here”. I tried taking out just the second link, and it did the same thing with the “this” link instead. I didn’t think to take a screenshot beforehand, though. "puzzle games work fine with simple CONTROLS"
Take out "Even if you" from the Scribblenauts sentence. The "Yes" is referring to the fact that they have similar features. The rise from the grave art is terrifying! But I do love Tim’s “how dare they”‘s. I’m incredibly late in commenting, but I just wanted to say Nice Podcast Guys! This was a good way to start off the new season, and the new segment art is refreshing and looks great. Does anyone even know im here?? ?